Nothing but the battle, it's on as soon as you start the game. Cannons firing everywhere! Unidentified tanks - you can't tell if they're allies or enemies! 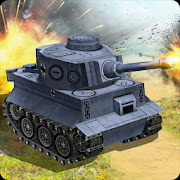 Participate in a real war by playing Battle Tank!! !